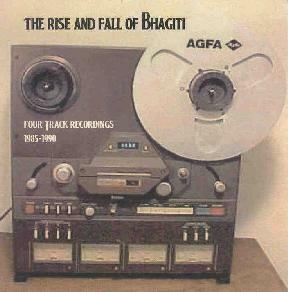 Bhagiti - "The Rise And Fall Of Bhagiti"
Bhagiti was the moniker used by improviser Eric Wallack for his solo 4-track recordings many years ago. This collection includes music recorded between 1985-1990 and the tracks were chosen from 20 of approximately 50 cassettes Eric recorded as Bhagiti. Listening to the 21 tracks on this compilation it's clear that Eric would have fit quite comfortably with the whole DIY homemade cassette networking scene of the 1980's. Those of you who have heard Eric's music from the past couple years already know what a unique talent he is, and I'm confident that anyone following the reviews and interview this issue are finding their curiosity aroused. Though lightyears away from what Eric is doing these days, The Rise And Fall Of Bhagiti is important because it helps paint the larger picture to include Eric's earliest recording years, and illustrates even further how varied his musical and stylistic interests are. Contact via snail mail c/o Eric Wallack; 445 North Main St; Bowling Green, OH 43402.